The issue has been at the centre of the dispute at Stormont. Irish language act campaigners in Stormont. THE COUNCIL OF Europe has recommended that the United Kingdom introduce legislation to protect the Irish language and the rights of Irish speakers. In a new report published today, the organisation also recommend that the UK government attempts to create a “political consensus” to ensure this happens. The Council of Europe is distinct from the European Union and aims to promote human rights, the rule of law and culture across Europe. The European Court of Human Rights is under the Council of Europe and 47 states are signed-up members. Part of the Council of Europe’s work is to promote language and it is under this role that it is critical of the UK’s progress on minority languages. As well as Irish, the council has also encouraged greater protection for the Cornish language. Should engage in a dialogue to create the political consensus needed for adopting legislation. The push for a standalone Irish Language Act by several Northern Ireland parties was cited by the DUP as the reason talks with the Sinn Féin over government formation broke down last week. In its report, the Council of Europe also said the Northern Ireland Executive has a duty to ensure that national and ethnic minorities have access to their rights. The recommendations from the Council of Europe have been welcomed by numerous Irish language groups. Conradh na Gaeilge said it again shows that the British government has “clear outstanding obligations” in this area. “This is not the first time the British government has been subject to criticism from international committees due to the lack of progress on Irish-language rights but we now hope, with the spotlight currently focusing on the language questions, that satisfactory provision will be implemented without further delay,” said CnaG president Dr Niall Comer. Irish language advocacy group Pobal said the British government now has “no escape” from the need for an act to protect the Irish language. 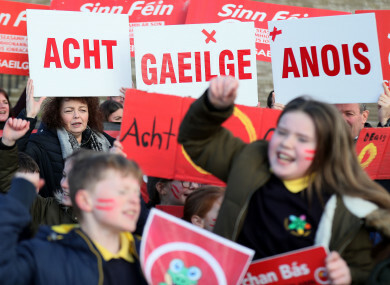 “In this case, we see no reason why Westminster should not now act to bring in Irish language legislation,” said Pobal director Janet Muller. Email “The Council of Europe has told the UK to pass laws to protect the Irish language”. Feedback on “The Council of Europe has told the UK to pass laws to protect the Irish language”.